Are you needing back-to-school shoes next week? 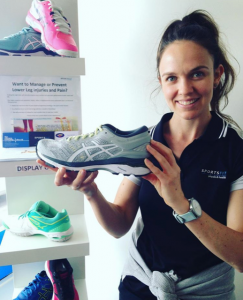 Hayley, our Podiatrist in Glen Iris, knows buying school shoes is one of the biggest challenges of the new year! For starters, kids are so fussy and seem to ‘need’ the latest trend to match their mates, but they are also growing at a fast rate! Knowing that they could ruin their school shoes, grow out of them in 6-weeks or even lose them – these tips from our podiatrist will help you buy appropriate school shoes that will last a respectable amount of time. Firstly, it is handy to know the expected growth stage for age. There is no wrong or right as every child has a different growth rate! Growth occurs most rapidly in their earlier years of life, and continues until they’re about 15 years old (sometimes older – especially in boys). Shoe sizes usually need updating between 3-6 months, give or take. For example, little John who is starting school at age 5 wears a size 12 US shoe – he will more than likely be a size 13 US by halfway through the school year. Breathable leather-upper or mesh-upper material. There MUST be one thumb width between the longest toe (usually big toe or 2nd toe) and the end of the shoe. This should always be tested in a standing position, NOT sitting. The shoe must be correct in the width around the heel, and around the front of the foot with no gaping (which means it is too wide) or bulging over the seams (which means it is too narrow). Ask your child if they feel comfy. Get them to walk or run around the shop to trial. They’re the best judge of ‘feel’. Leather shoe, running shoe, cross-trainer, court shoe or casual shoe – what do I purchase? It depends on school policy and what the shoe will be used for. Some schools require a smart black leather lace-up for class time and an additional PE ‘sports’ shoe. A court shoe is used for netball, tennis and basketball. It is the most durable shoe on the market, but with less cushioning. A cross-trainer is used for varied sports (running, basketball, cricket and general everyday wear. It combines durability and cushioning. Both court and cross trainers are usually made with a leather upper toe box. A running shoe is used for running and grass sports. It is usually the lightest option made of mesh and the most cushioned. It is the least durable option when comparing it to other shoes like cross trainers and court shoes. Do I get a neutral or stability shoe? Some shoes, especially sport shoes, have additional ‘arch support’. It depends on the child’s foot type whether they need a neutral or stability shoe and it is best to check this with your podiatrist before purchase. If an orthotic is being used, it is best to go a neutral shoe. Teach your child to unlace their shoe after use, and not to kick/slip them off! This will help maintain to shape and support of the heel counter. Use a scotch-guard spray to help repel water and clean them every so often with a damp cloth using soapy water. Choose a shoe for the correct purpose. For example don’t get a running shoe for a child that purely plays basketball. A court shoe will have better support and last a lot longer. The more expensive the shoe the better quality. The average cost nowadays is $60-$120. For further information and advice on footwear, or for children’s foot assessments make an appointment with our friendly podiatrist Hayley.